Hi friends it's been a long time since I posted any of my daughter's school projects .Of late most of the time they are made in such a hurry that I either forget to take pictures or they are made at night so I end up with grainy blurry pictures not worth sharing! But this one was made completely by my kiddo with no help at all from me and I do have some decent pictures to share with all of you! 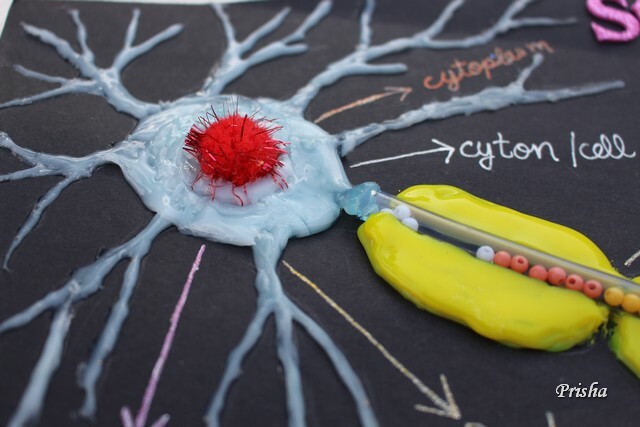 Can you believe some of the popular posts on my blog include "How to make a Tooth Model" and "How to make a Respiratory System Model"! 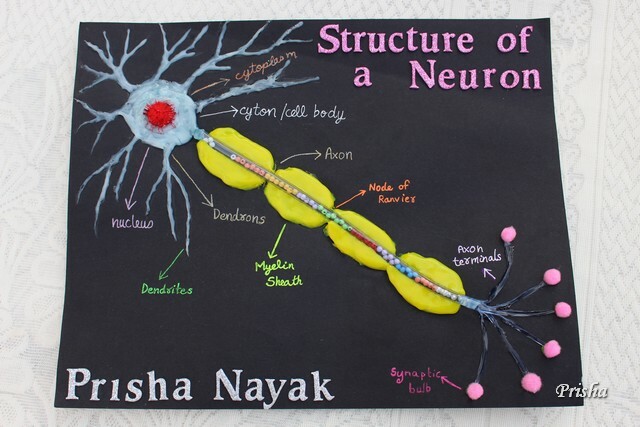 So in case you landed on this page by googling " how to make a neuron model" let me run you through the creative process so that you can make a neuron of your own!! To make a dimensional model on paper use thick paper as your base and avoid very heavy materials on top. If you have light weight clay such as Amos clay or Sakura clay you can make your structure using clay like in this Tooth Model we made long back. For this model my daughter used different colors of hot glue! 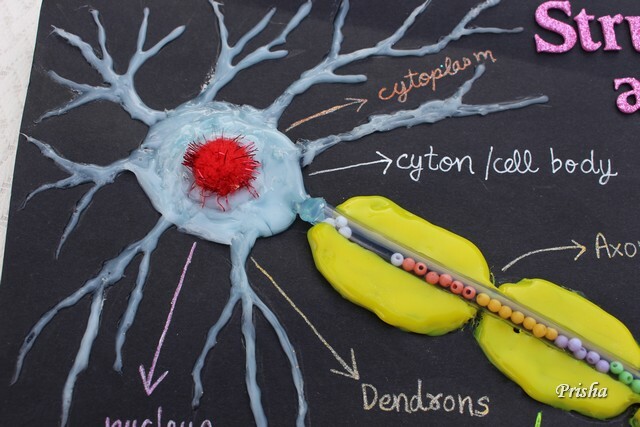 The cellbody and the dendrites were made using white hot glue. It is tricky to get the hot glue drawn into the thin dendrites so if you are not confident with hot glue do practise getting thin lines first and avoid hot glue altogether with young children! The nucleus in the cell body was created by sticking on a red spiny pompom! The central part of the axon[axoplasm] was made using a plastic tube filled with beads and sealed at both ends. A word of advice here...avoid seed beads as they are too tiny and don't move around well. The beads my daughter used here are inexpensive but medium weight beads which roll within the axoplasm and are wonderful to give the illusion of a nerve impulse travelling down the axon! 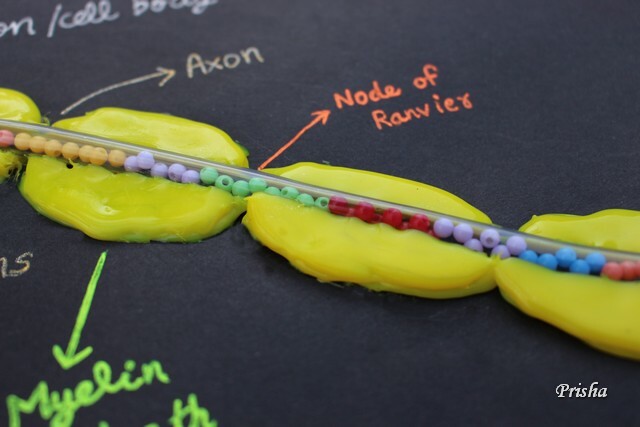 The yellow myelin sheath of the axon was again created using hot glue. 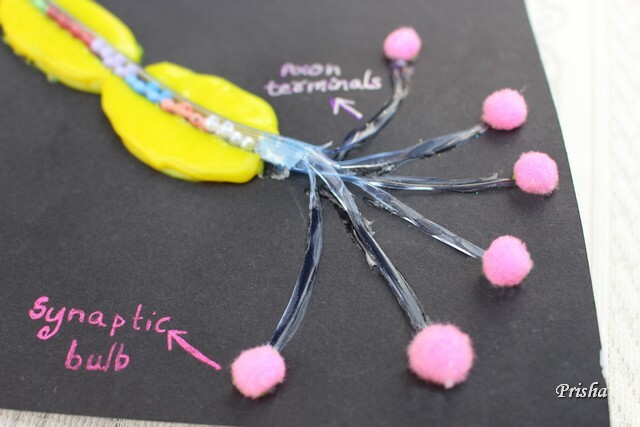 The end of the plastic tubing was split using scissors into multiple filaments to make the axon terminals and the synaptic bulbs was created using pink pom poms! Fantastic work by your daughter Sonia, how clever she is. This is a lovely project, Sonia, and really inspiring. Congrats to the teacher for the inspiration. Hugs, my dear friend. So AMAZING!!!!! She did such an AWESOME job on this!!!!! Beautifully done! She's certainly inherited your creative genes. Thank God my day's of projects have ended. It was always done last minute & late night when I had to help. I seldom took pics for the same reasons. Great work by your daughter, I'm not surprised this was put on display in the class. Even I can understand this Superb example, what a clever daughter you have. Surely she must have an A+ for this fabulous work. That is such a clever and creative idea! What an awesome idea and congrats for having it displayed!! :) Love how you've used this to make learning so fun!! Wow!!!! Sooooo cool and useful for school! Your daughter's talent always shines! :D Yo have to be really proud! Wow!! This is very creative!! She's really talented! Kudos to her and to you for kindling her creative side! Great project... Very creative and cool!